Sunday saw Dover Rowing Club in action at Folkestone Regatta. The day started in perfect conditions with Dover having 5 competitors in the Novice Sculls heats. Tom Stothart and Paul Scrivener qualified comfortably whilst Cameron Mackintosh narrowly missed out finishing in 5th. Harry Platts and Tony Burrows were further back after poor starts. The final was a very different affair raced in challenging conditions with a heavy wave taking out Stothart. 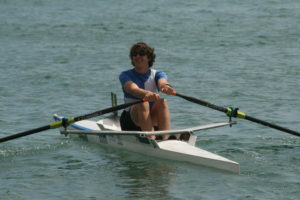 Scrivener fought hard but was overhauled in the last 500m and dropped to 4th place. 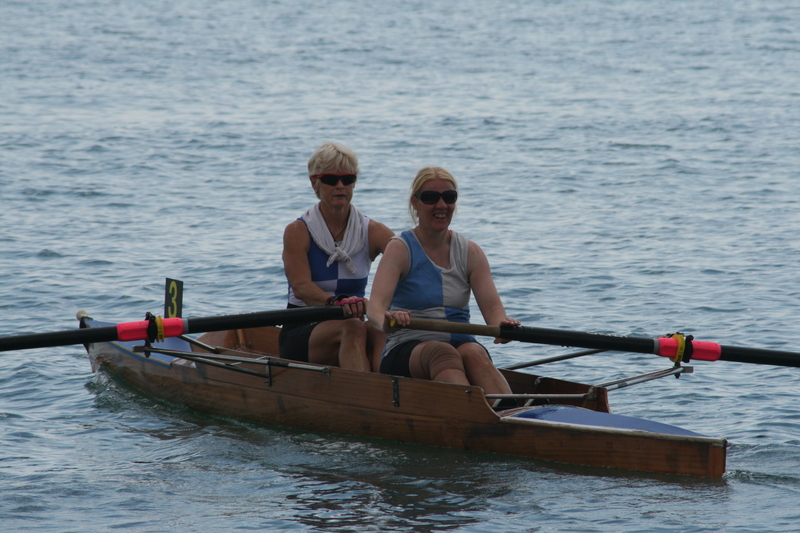 The Ladies Double Sculls event saw Dover entering two crews with Jo Johnston and Mary Newcombe racing Maria West-Burrows and Megan Barter. Johnston/Newcombe got off to the better start and were competing with the leading crews whilst West-Burrows/Barter fought for the lower points places. From the turn Johnson/Newcombe fell away from the leaders finishing in 4th with West-Burrows/Barter missing out on points in 8th. 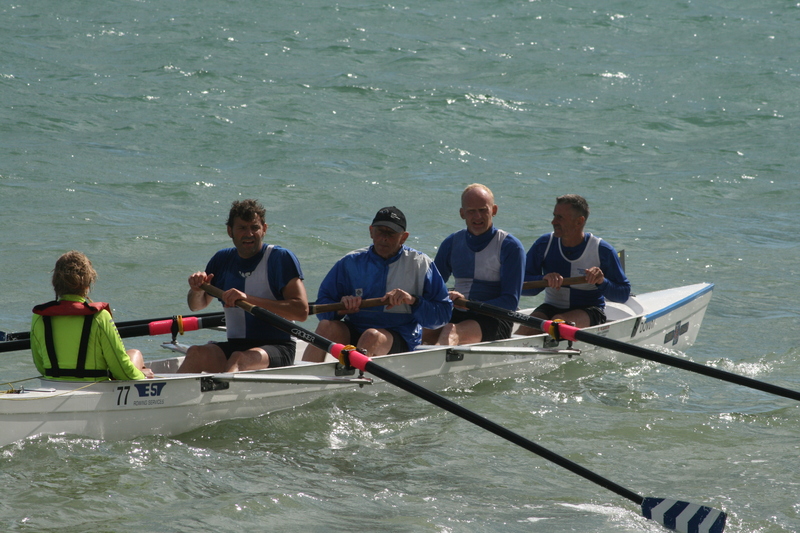 The Senior Men’s Four race saw Dover racing for the 1st time this season; Scrivener, Nick Bailey, Guy Hadfield, Tony Burrows with Chrissy Purvis coxing. Dover’s crew fell behind in a very competitive field and were unable to close down the field after the turn, coming home 8th. The Ladies Junior Four saw Jen Jordan, West-Burrows, Purvis, Petra Matthews-Crow coxed by Johnston jump to a great start finding them in 2nd as they approached the buoy turn. On the return leg the Southsea crew on the outside stormed past leaving the Dover crew in 3rd position which they held despite a late charge from Folkestone. 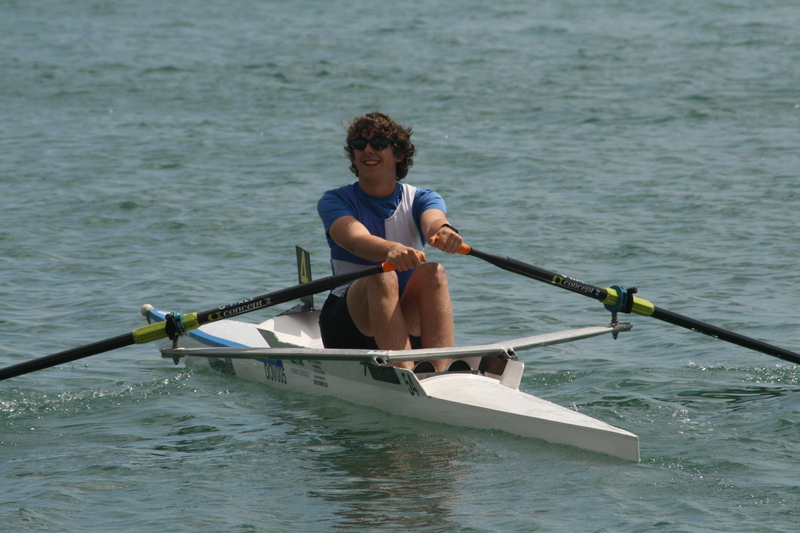 Men’s Junior Sculls again saw heats with Chris Price in the first race failing to qualify. Chris Hall and Robin McCorkell comfortably qualified for the final with McCorkell crossing in 2nd. The later final saw McCorkell capsize on the outward leg and Hall narrowly avoiding him in the water thanks to a warning from another racer. Hall worked hard to recover from the disrupted start to take the buoy in 4th place but was unable to improve his position. 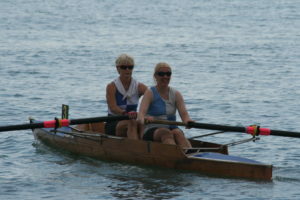 The Ladies Senior Pairs featured West-Burrows and Johnston. 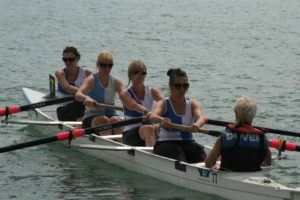 The race settled out into a battle for 3rd for the Dover crew as West-Burrows with her knee heavily strapped began to struggle from the turn, but the pair determinedly held off the chasing Deal boat to maintain 3rd place. The Novice Men’s Four saw the DGSB boys crew of Michael Scales, Austin Mills, Stothart, Mackintosh coxed by Newcombe on the water. The crew was 2nd off the line and were close on the heels of the lead boat until it executed a brilliant turn taking the Dover boat out of contention. On the home run Southsea on the outside again found a faster run leaving Dover battling Folkestone at the end for 3rd with the Dover boys just holding on. McCorkell and Hall were Dover’s entrants in the Men’s Junior Pairs. The normally reliable crew had a terrible start and things got worse at the turn as Hall’s blade caught under the buoy leaving them trailing home in 8th. The open Veteran 50+ Fours saw Scrivener, Dixon (Shoreham), Bailey, Johnston coxed by Purvis give a battling performance. The scratch crew performed well coming home 4th. The Men’s Junior Senior Four saw Price, McCorkell, Hadfield, Hall coxed by Newcombe get off to a good start level with the leading crews in choppy conditions. The experience of the other crews showed over the new Dover combination as they eased away heading for the turns. Dover secured the 4th spot out of the turns and held off Herne Bay on the return run. Newcombe and Barter entered the Ladies Junior Pairs as the conditions worsened. The Astor girls struggled as they were thrown around in the rough seas and were unable to hold off the Deal crew in the last 200m leaving them in 4th. The Men’s Junior Four of Platts, Stothart, Hadfield, Hall coxed by Mackintosh competed in one of the largest fields of the day. With spray flying from the blades all the crews battled the conditions from the start. The Dover boys fought their way through the field to contend for the higher points finish coming out of the turns in 4th but were unable to close down the 3rd placed crew on the run to the line. The final race of the day was the Veteran 40+ Fours featuring Scrivener, Burrows, Bailey and Victor Evans coxed by Purvis. A solid performance saw the older crew finish out Dover’s day with another 4th.